How clean is the diesel fuel that you’re relying on? Never assume fuel quality is not an issue. 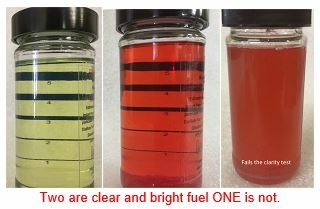 If you’re not using diesel fuel test kits on a regular basis, you probably don’t have any idea what kind of condition your diesel fuel is actually in. Change that today by investing in test kits for diesel fuel from Dieselcraft. Our kits are designed to test for the presence of microbes and water in diesel fuel so that you’ll know whether or not you have to worry about bacteria, mold, and more affecting your fuel supply as well as your diesel engines and its fuel injectors. 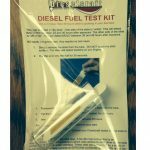 Dieselcraft can supply your company with a wide range of diesel fuel test kits. From the relatively straightforward DS-1 Test Kit that will check for bacteria in your diesel fuel to the more advanced FCT-100 Diesel Fuel Water Content & Fuel Clarity Test that tests diesel fuel, biodiesel blends, and even heating oil, all our tests are easy to use and will provide you with real-time results in 5 minutes or less, in most cases. They include all the supplies and instructions you’ll need to look for microbes and water in diesel fuel. If your company has stored diesel fuel, it’s a good idea to use diesel fuel test kits on it every 90 days to make sure water hasn’t found a way to get into it. 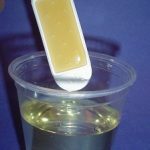 You should also get into the habit of using test kits on fuel deliveries to make sure there aren’t microbes and water in diesel fuel before you accept it. It’ll help you avoid a headache later and allow you to steer clear of using diesel fuel that could potentially have bacteria, mold, fungus, or even dangerous asphaltenes in it. 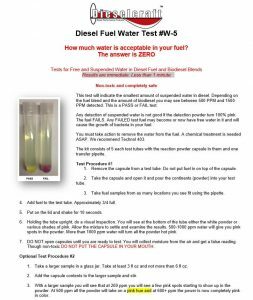 Take a closer look at each of the diesel fuel tests kits available through Dieselcraft here. Contact us at 530-613-2150 on the West Coast or at 772-215-8087 on the East Coast for additional information on dealing with microbes and water in diesel fuel. This test is called a “dip slide”. One side of the slide is “white” this will detect BACTERIA between 24 and 36 hours after exposure. The other side of the slide is “off white”. This will detect MOLD between 36 and 48 hours after exposure. NO spots are good news. Any reaction is bad news. Select DS-1 Bacteria Test plus Fuel Clarity and Water Content Test Kit. One test does it all. Remove the capsule from a test tube. Add fuel to the test tube. Approximately 3/4 full. Put on the lid and shake for 10 seconds. Holding the tube upright, do a visual inspection. Allow the mixture to settle and examine the results. 500-1000 ppm water will give you pink spots in the powder. More than 1000 ppm water will turn all the powder hot pink. This is a PASS or FAIL test. This test will indicate the smallest amount of suspended water in diesel. Depending on the fuel blend and the amount of biodiesel, between 1000 PPM and 1500 PPM will be detected. 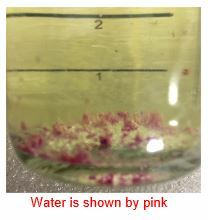 Any detection of suspended water is not good if the detection powder turn 100% pink. The fuel FAILS. The kit consists of 5 each test tubes with the reaction powder capsule in them and one transfer pipette. 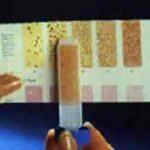 This test is designed as a field PASS or FAIL test to detect suspended water and solid contamination in diesel fuel. Test Procedure One – Fuel Clarity Test. Take a fuel sample from the bottom of your fuel tank, the closer to the bottom the better. Check visually for evidence of water or particulate contamination. Swirl the sample to produce a vortex and examine the bottom of the vortex for water and solids. If you can see free water, stop the test. The fuel has failed and there is no need to continue with part 2. Take the capsule and open it and pour the continents (powder) into your test jar. The powder will start to settle to the bottom and you will see at the bottom of the jar either the white powder or various shades of pink. • More than 600 ppm water will turn all the powder hot pink Hot Pink is a FAIL and action must be taken. Put a fuel sample the specially designed test jar. If the fuel is clear and bright all five indicator marks show through the fuel and the fuel PASSES. As the fuel clouds the line disappear and the fuel FAILS. More than 600 ppm water will turn all the powder hot pink. Hot Pink is a FAIL and action must be taken. Tests the pH of the water from your water separator. Any pH less than 6 means the fuel is Acidic. The more acidic the more damage it is doing to your fuel tank. This test will indicate if the water in fuel is acidic. Acidic fuel could be caused by bacteria growing in the tank. The kit consists of 1 each test tube with 10 test strips and one transfer pipette. Your sample must be the “free water” from your water separator. Meaning you must see the separation between the fuel and the water on the bottom of you container. Take a sample from your separator into a glass jar so you can see the separation between water and fuel. You do not need but I once of water. 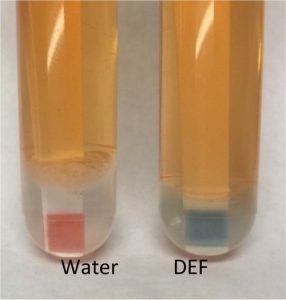 Remove one test strip from the package and place it so the colored end is down into the test tube. Take the water sample using the supplied pipette so it contains fluid from the bottom of your larger container and add it to the test tube until the tube is ½ full. Put on the test tube lid and hold the tube upright and do a visual inspection of the test strip. 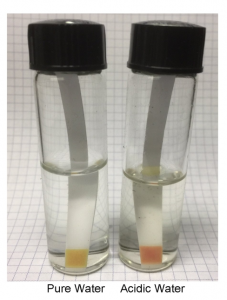 Acidic water will show as pink to red. You must work on removing the water from the fuel. A better separator, water blocking filter and chemical treatment are in order. Any questions call Dieselcraft. You have 10 tests. You can dispose of the sample taken and the test strip to comply with your local codes and reuse the test tube and pipette as before. This test will indicate free amounts of DEF in diesel. This is a PASS or FAIL test. Take the fuel sample using the supplied pipette so it contains fluid from the bottom of your larger container and add it to the test tube until the tube is ¾ full. Put on the test tube lid and hold the tube upright and do a visual inspection of the test strip. Water will show as brown to pink where the DEF will turn BLUE in a few seconds. You have 10 tests. You can dispose of the fuel sample taken and the test strip to comply with your local codes and reuse the test tube and pipette as before.